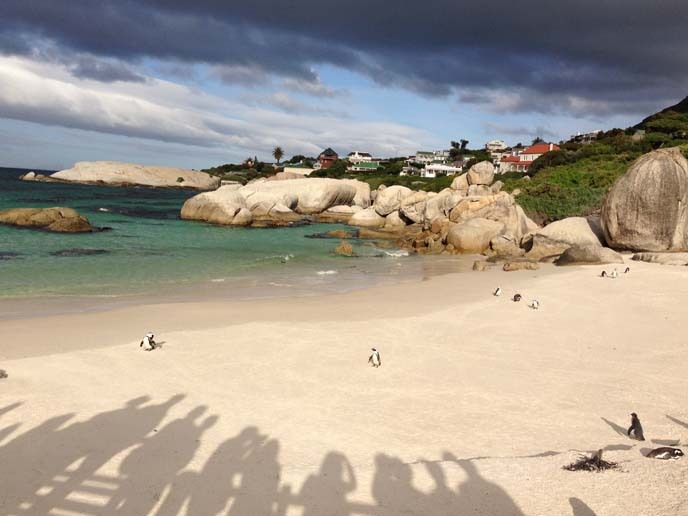 Steampunk cafe & Penguins in South Africa! 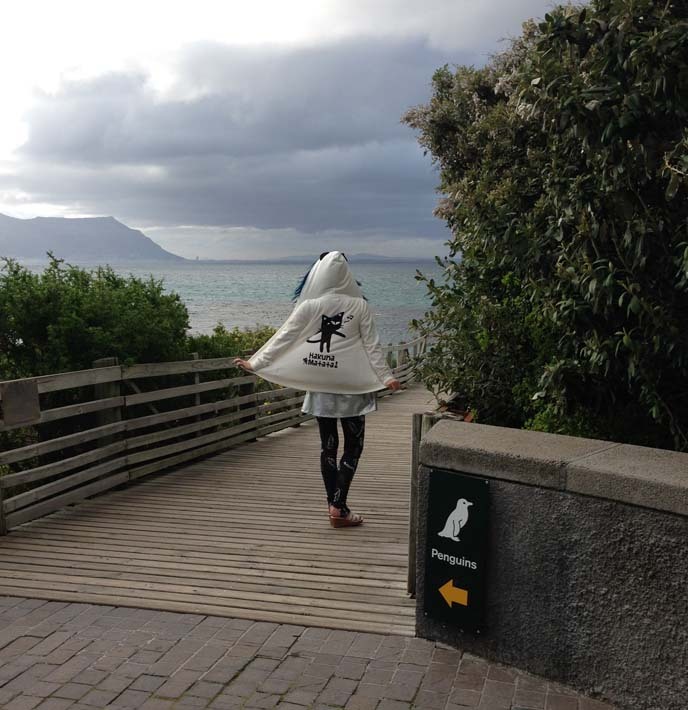 Truth coffee, Cape Point, Boulders Beach. 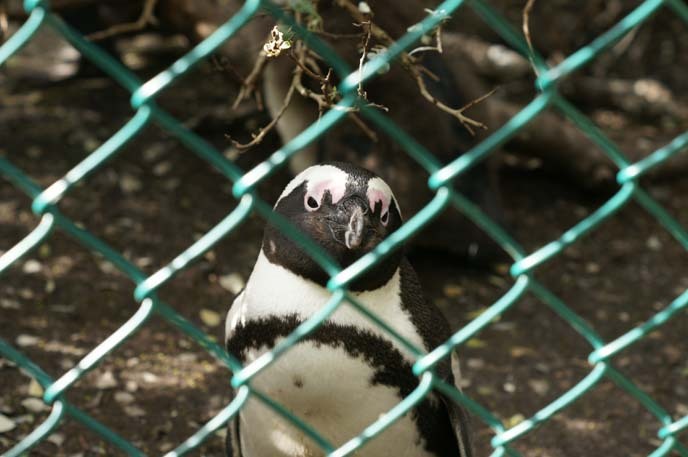 Everyone knows you can go on safari in South Africa… but did you realize there’s a penguin beach colony and steampunk cafe here? No? Then waddle along with me as I discover these unexpected places… and get bitten by a few animals long the way. 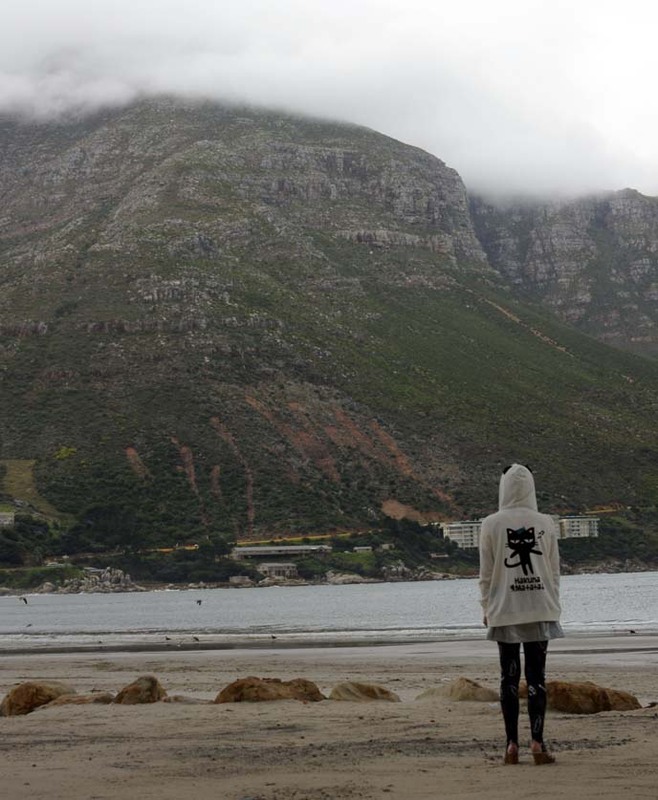 My team and I stopped briefly to take in this view of the mountain ranges and ocean. 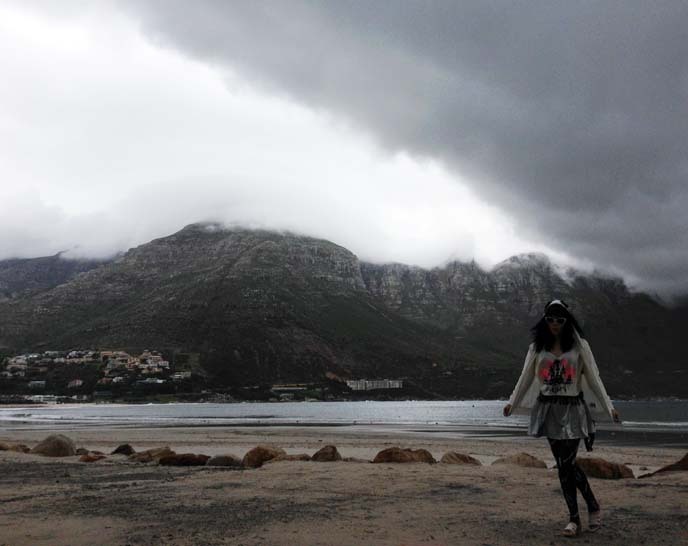 July is winter in South Africa, hence the slightly menacing weather. 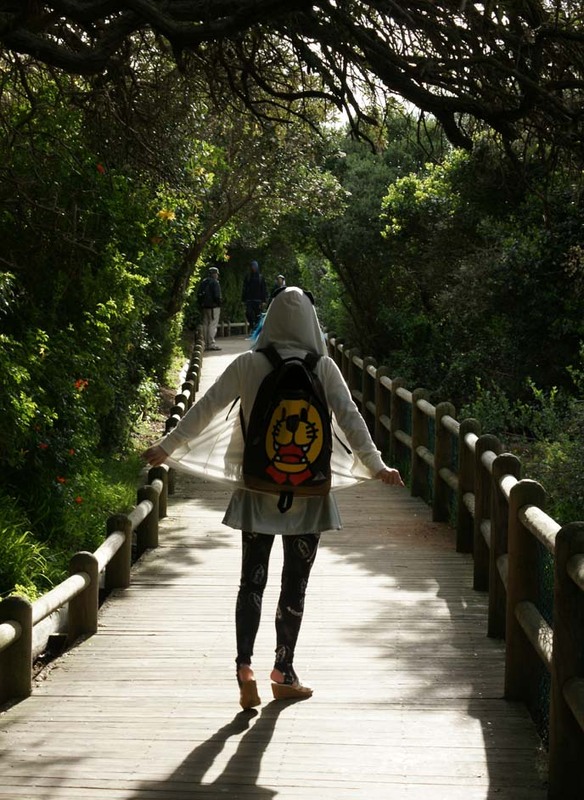 I kept warm with a Hakuna Matata cat hoodie from Artbox in Seoul. 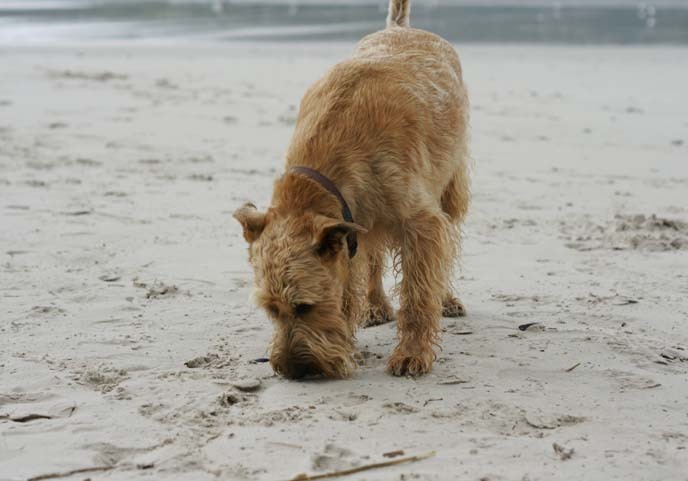 This little dog seemed to be sniffing for seafood. Photography by me, Melissa Rundle and Eric Bergemann. 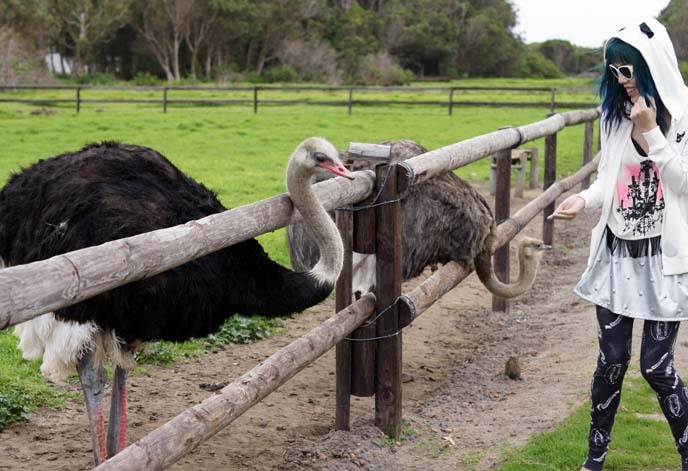 Another quick stop, this time at Cape Point ostrich farm. It was established in 1960s, as a breeding ground for these fluff-bodied, bald-headed birds. 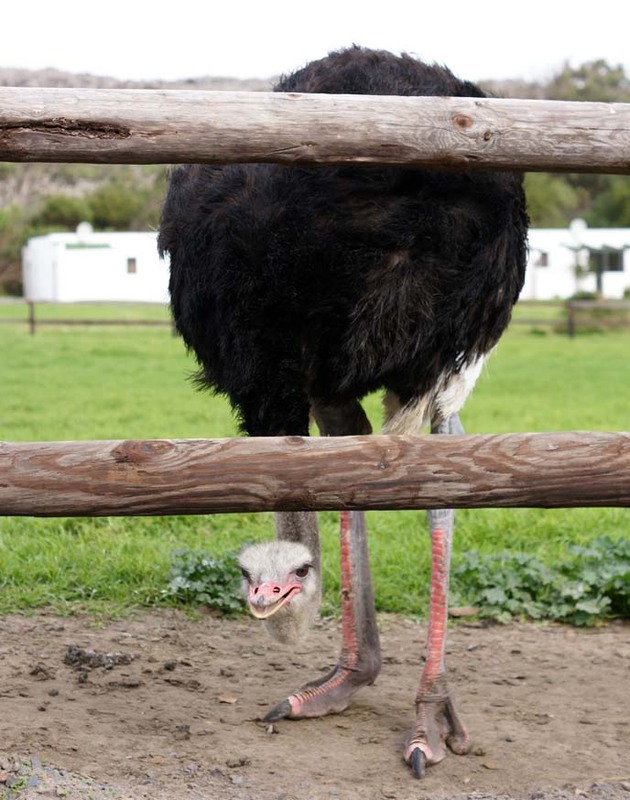 I gave it a try, and this angry-looking ostrich pecked my palm! Yes, I screamed. Finally, we made it to Table Mountain National Park. 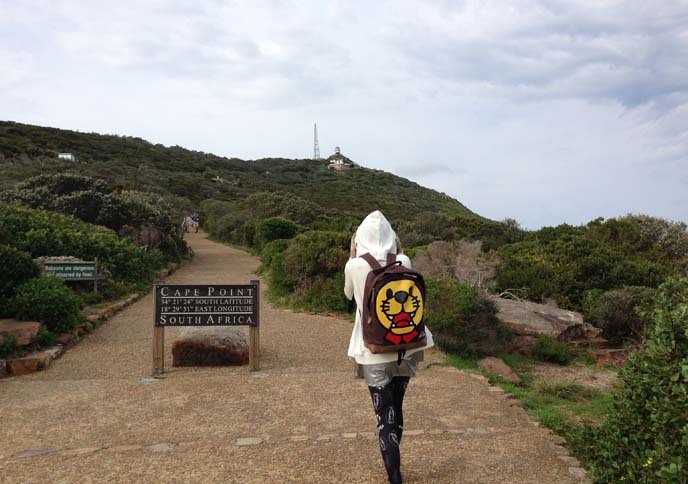 The sign shows the coordinates of Cape Point. 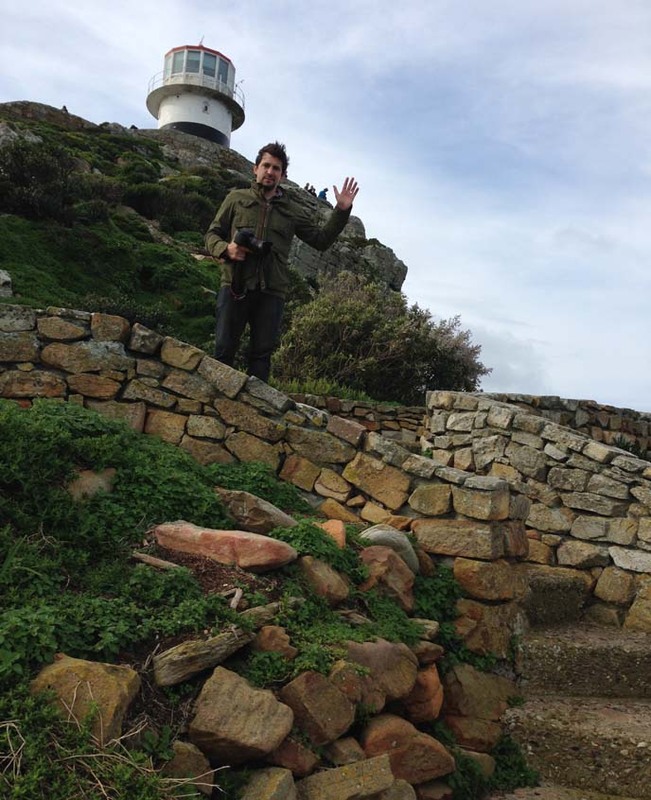 From there, it’s an easy 30 minute walk to the lighthouse. We filmed so many incredible shots from up high — can’t wait to show you the video. After this mini-hike, we were ready to eat. A lot. 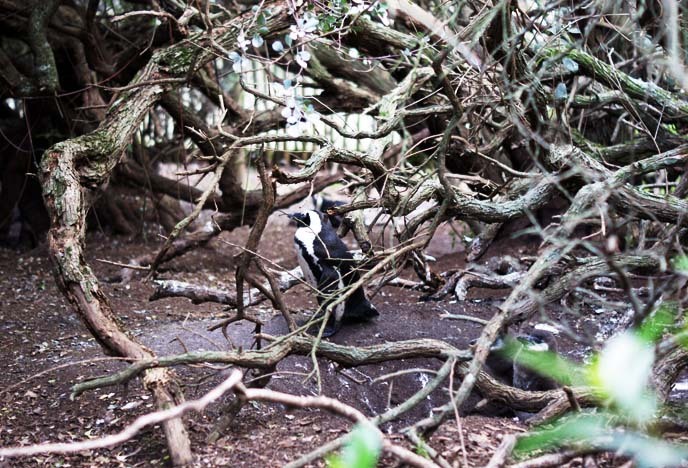 And then… it was time to see the African penguins! Wait, what? 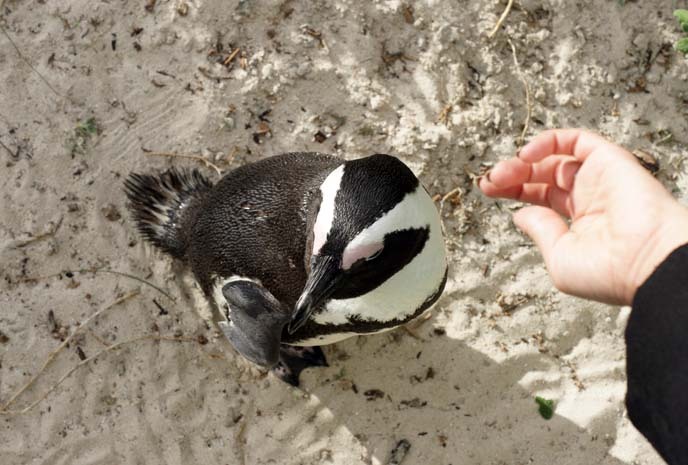 Yes, there’s a breed of black-footed Happy Feet, found only in these South African waters. 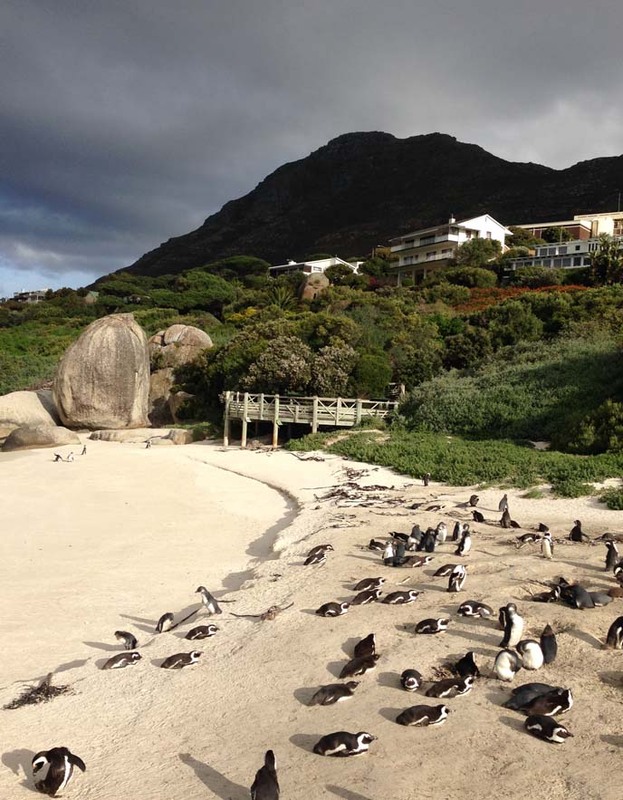 Boulders Beach is only a short drive from Cape Point, and it’s home to a large colony. 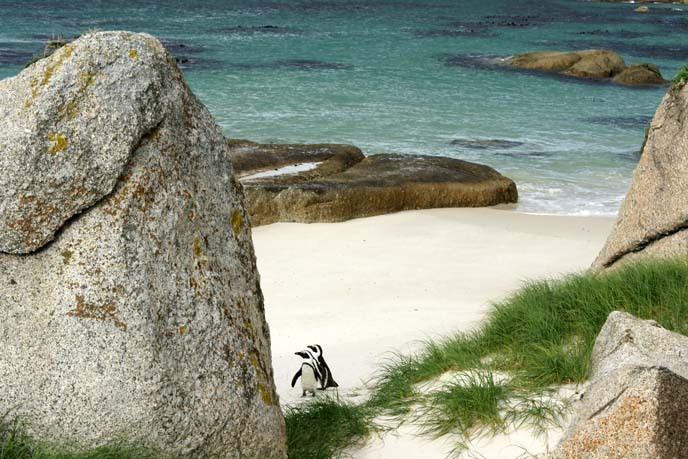 These penguins flocked here in the 1980s and took over the beach. Today, this is a popular attraction for visitors. 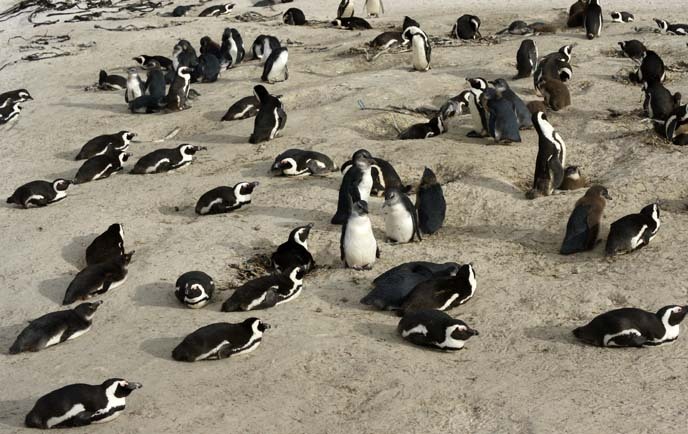 I mean, who wouldn’t want to see hundreds of cute penguins? 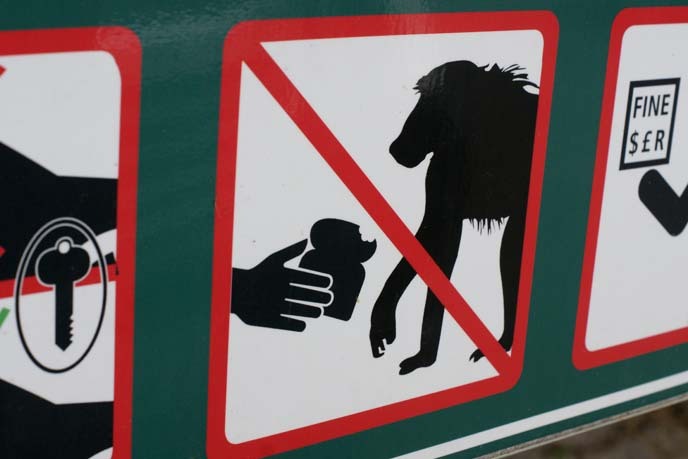 There’s a small entrance fee, which lets you get up close and personal with the little guys. 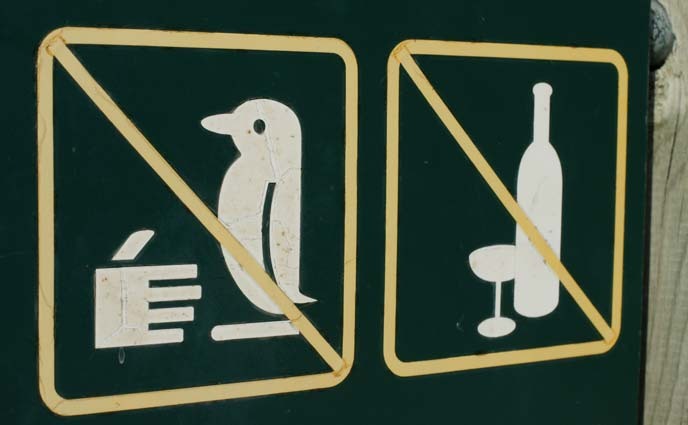 A sign warns, don’t pet the penguins. The closer we got to the sandy beach, the more penguins we saw. Some of them clustered together and played. Others were babies, still with their fluffy down overcoats. 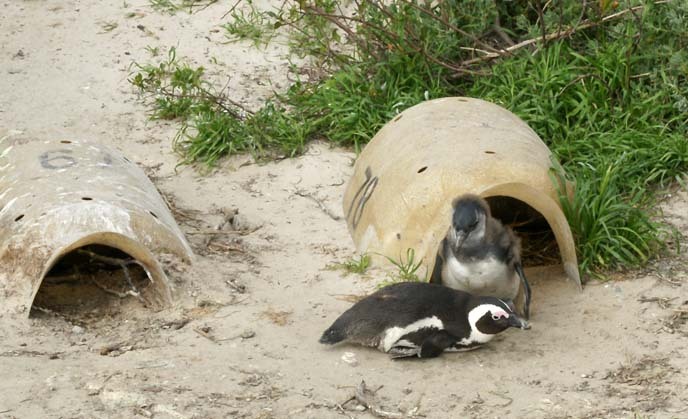 The park set up these little cave-homes for the penguin families to live and breed in. 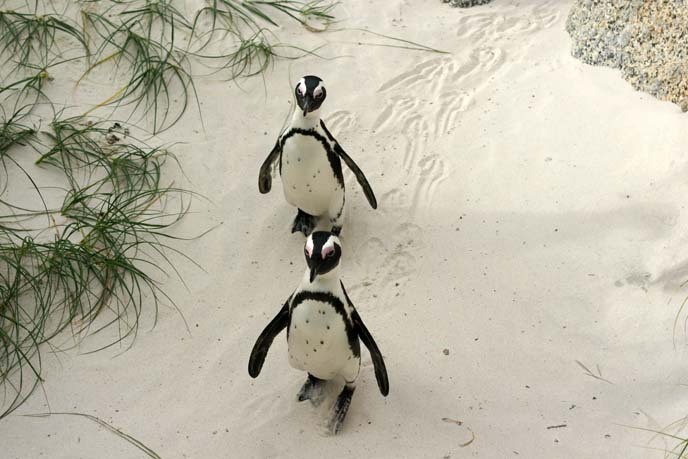 How cute, this pair of penguins leaving webbed footprints in the sand. At the end of the path, it was penguin-mania! This breed makes a funny braying noise, like a donkey. A few were waddling around, but most were resting on their stomachs. A lone penguin dips his foot in the ocean. 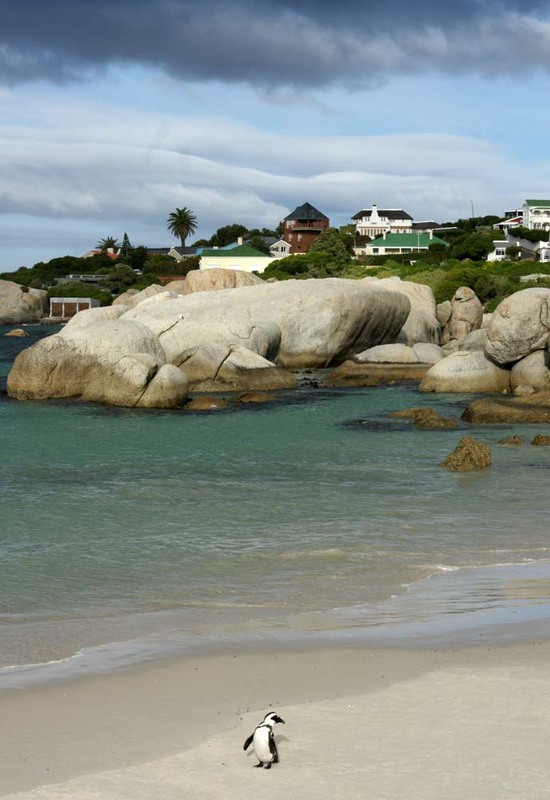 Isn’t the Cape Peninsula gorgeous? As you can see from the shadows, Boulder Beach is a favorite destination. 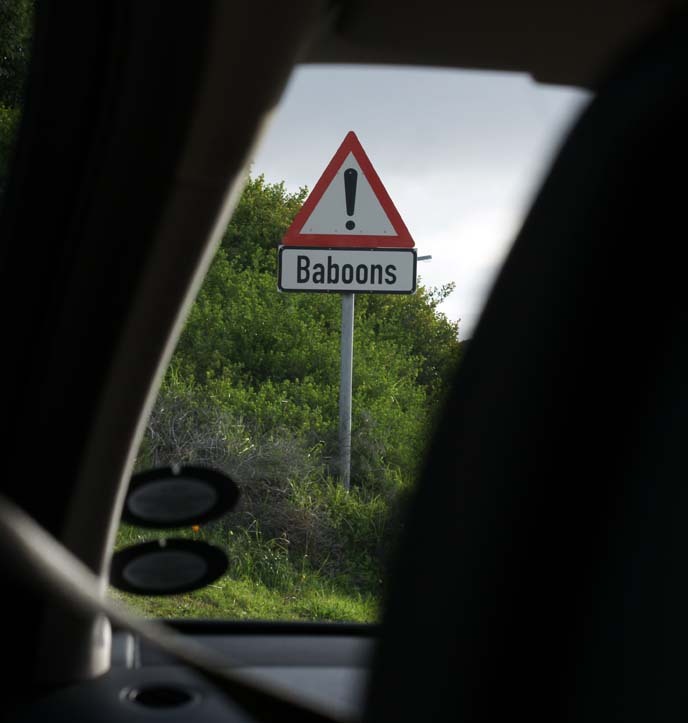 Coming here was one of my favorite moments in our South African press trip. 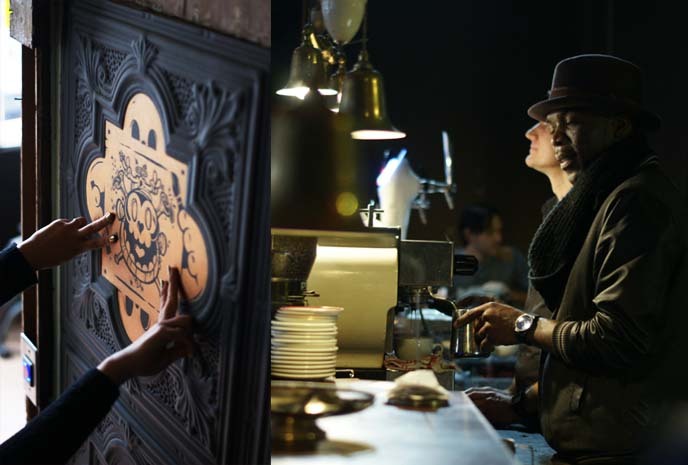 These “pirates” are passionate about producing the best artisan, small batch coffee — ever. Truth’s steampunk decor captures this spirit of experimentation and adventure. I’m drinking a “flat white,” a beverage similar to a cappuccino, but with less milk and a velvety foam. 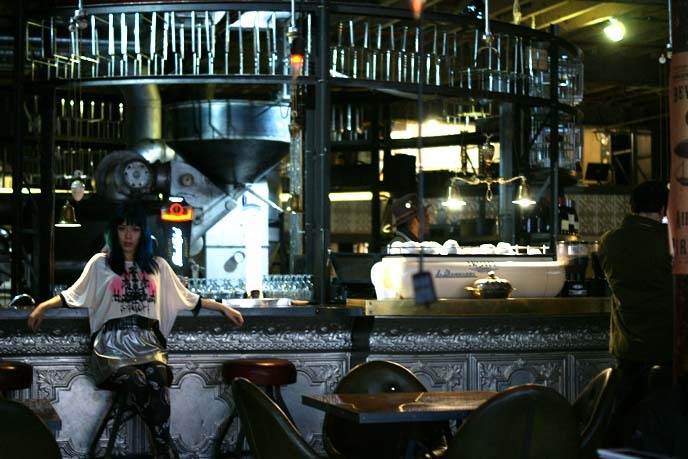 All around the cafe, I saw gears, brass, clockwork and old-time machine parts. 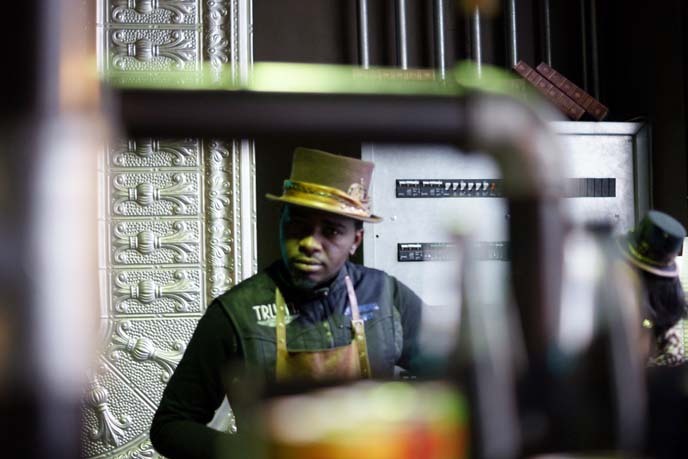 The baristas even dressed in top hats and suspenders. 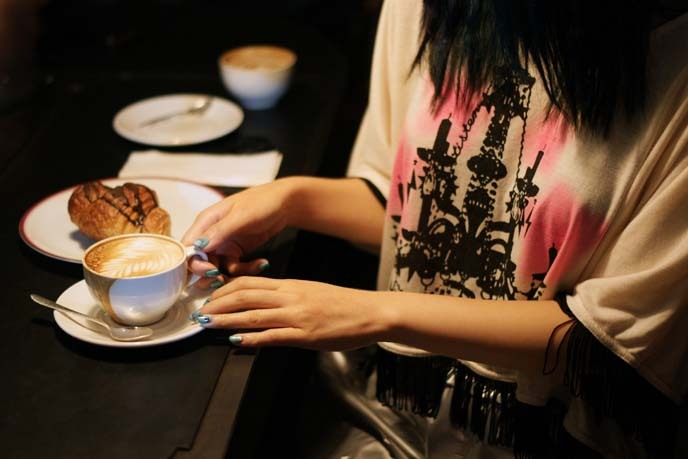 The food here is as excellent as the coffee, including the chocolate croissants, and “steampunk breakfast” of organic eggs, vegetables and flatbread. The focal point of Truth is “Colossus,” a 1940s Probat roaster with a cast iron drum, tricked out with mad scientist parts. 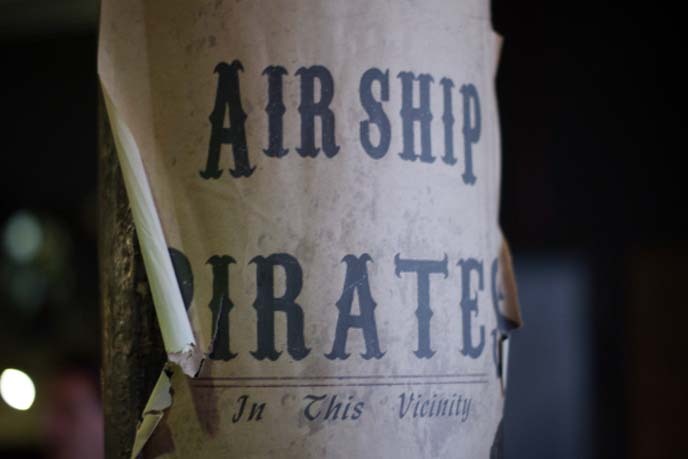 Truth Coffee often has wild performances and events befit for airship pirates, such as burlesque shows and steampunk parties. 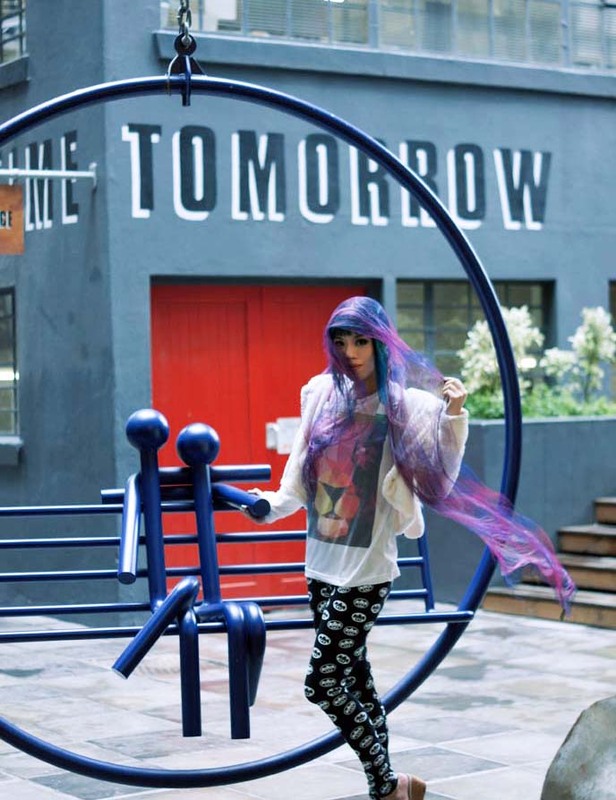 How cool, to see how people around the world are inspired by this subculture. 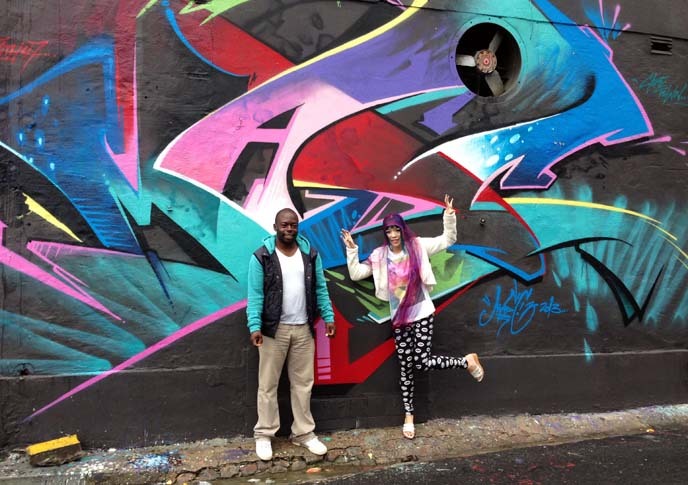 Cape Town colorful murals, street art & Woodstock Exchange. Off to Shanghai, Cebu, HK! Life has not been crawling at a snail’s pace lately: I’ve been overwhelmed with dream jobs and trips this year. 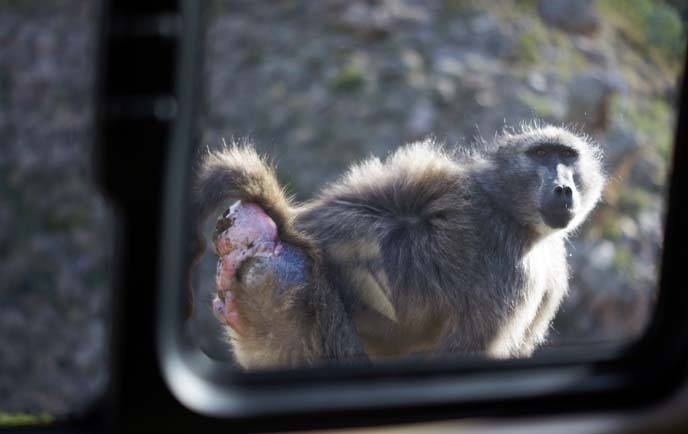 Bear with me, as I put together coverage from my trips to Africa and Asia. 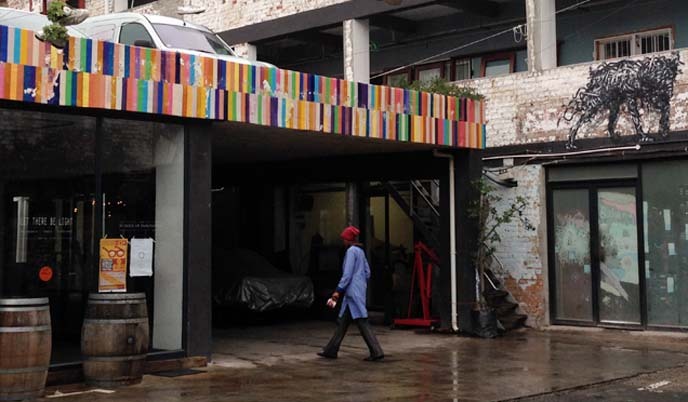 In this post, I’ll give you a tour of Cape Town’s colorful art in the Woodstock district. But first, announcing my next destinations. I’m going back to Hong Kong, and for the first time, I’ll be in Cebu and Shanghai! I’m working on a number of travel projects, including a partnership with a new hotel group. I’m also doing a major network TV shoot in Hong Kong, appearing on-camera as host and also arranging the production. 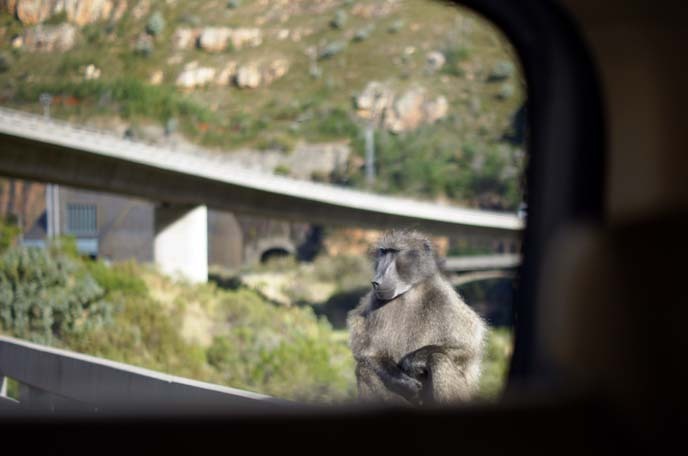 Now, let’s flash-back to my first time in Africa. 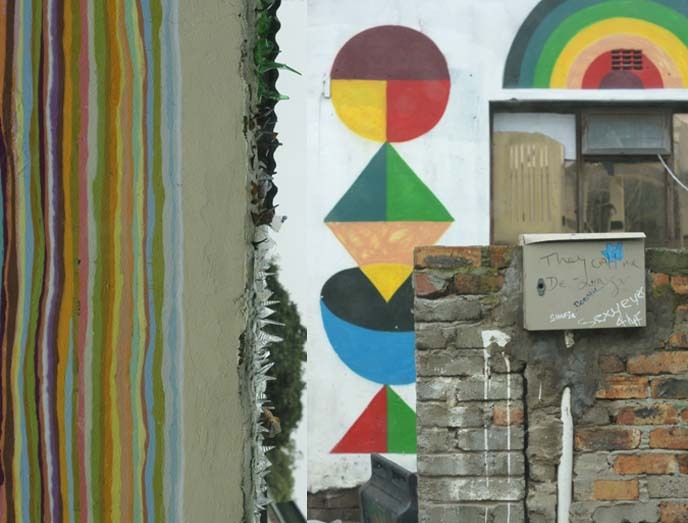 Archbishop Desmond Tutu described post-apartheid South Africa as a “Rainbow Nation.” His words describe Cape Town’s Woodstock district particularly well. 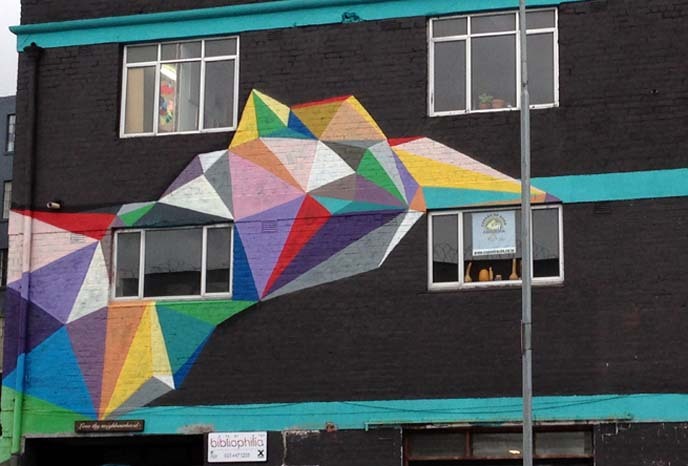 This neighborhood has developed from an inner-city slum into a colorful art haven. 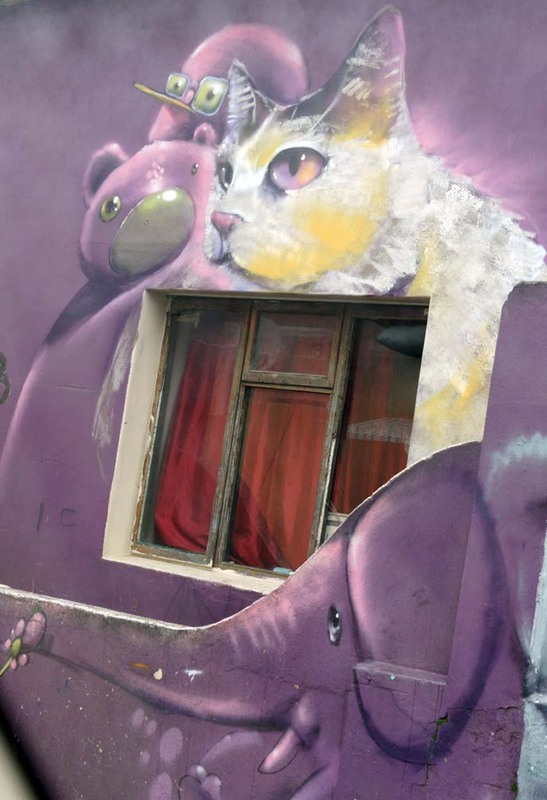 Locals live next to design studios, and in homes decorated by international artists. Juma Mkwela took my team and me on a Woodstock art walking tour. He came to South Africa from Zimbabwe, and was a victim of the 2008 xenophobic attacks. 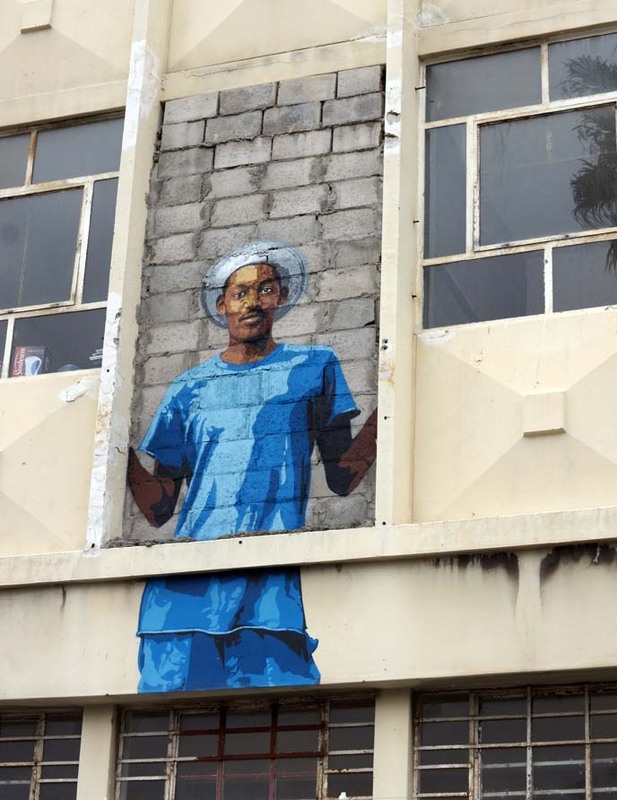 Juma turned this tragedy into an impetus for change: he now uses art to educate children, and inspire social development in disadvantaged areas. Not long ago, Woodstock was run-down with crime and drugs. 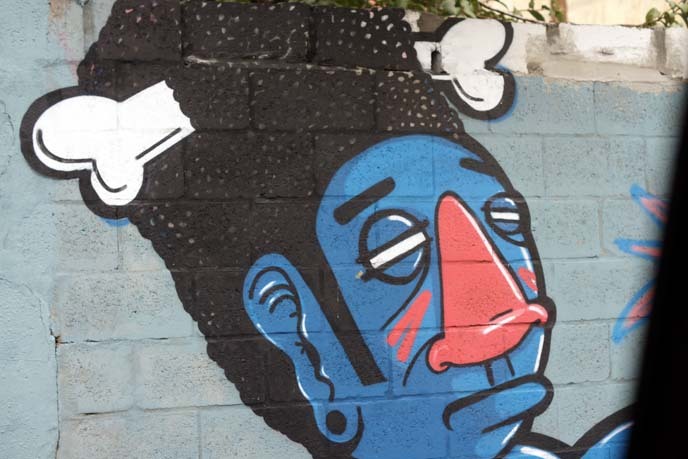 In 2011, a local artist called Freddy Sam launched a revival project, aiming to bring pride and color back into the community. Today, Woodstock is a trendy hub with homes painted by dozens of international artists, mainly with messages of peace and love. 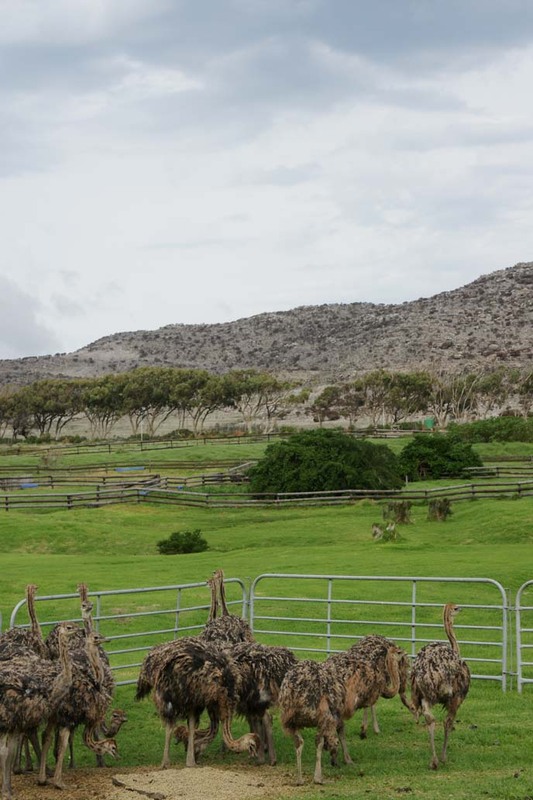 Many paid tribute to Africa, by depicting animals such as the ones we saw at Aquila Safari. 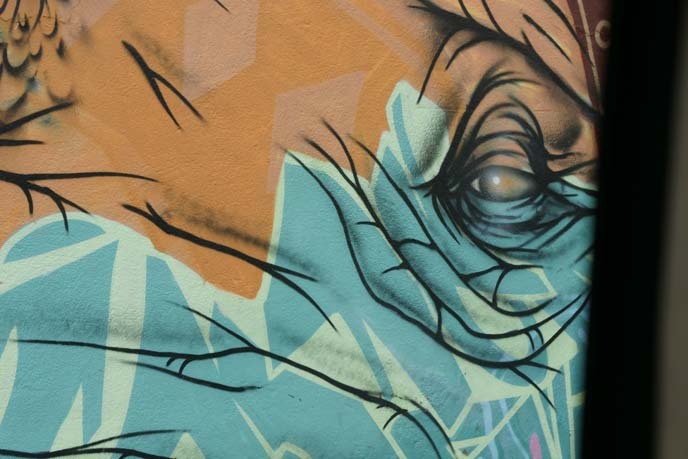 An elephant eye stares out from this wall. 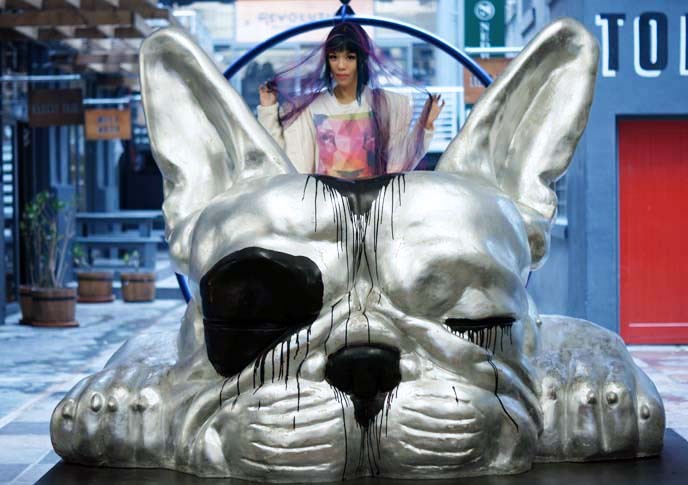 Pets are a popular motif. 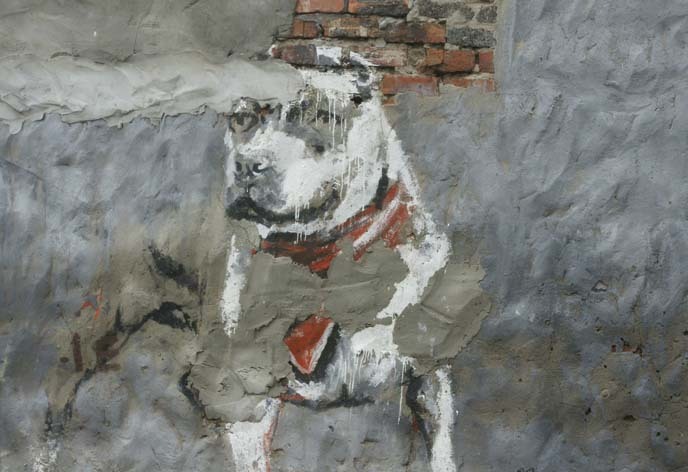 This dog painting integrates with the existing materials of exposed brick and cracked walls. Some of the works are provocative. 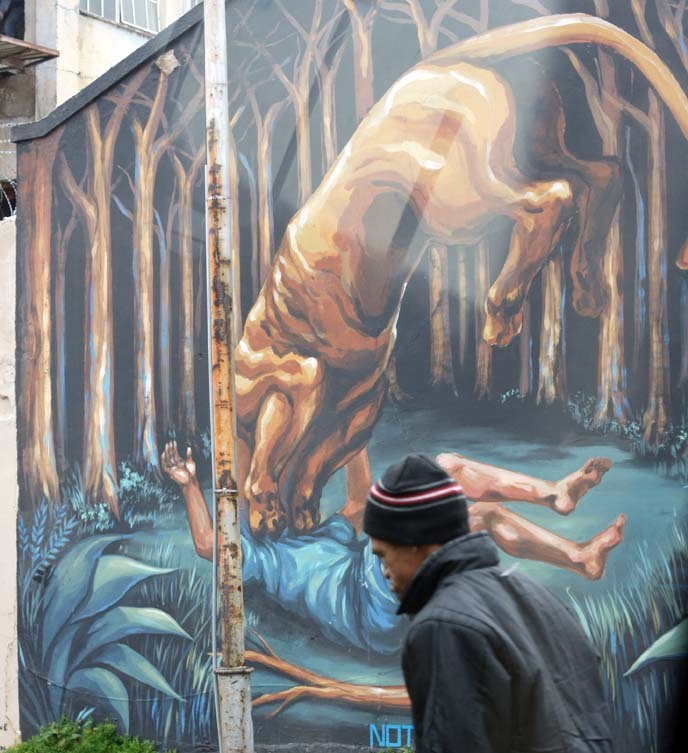 Argentinian artist JAZ made this “Not Eating” urban mural, showing a big cat devouring a man’s head. Here’s another version by JAZ, with colors that match the rust of the pole in front. 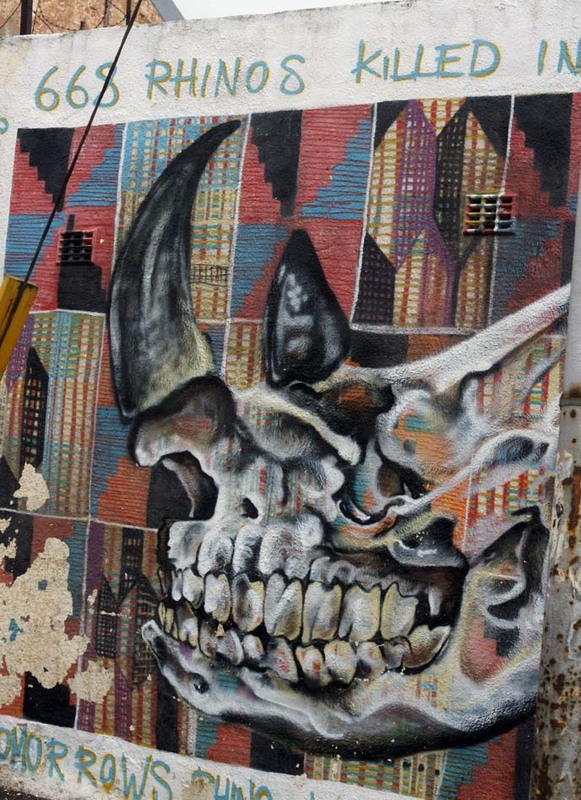 Juma told us that these murals revitalized the area, and created a sense of pride in the community. 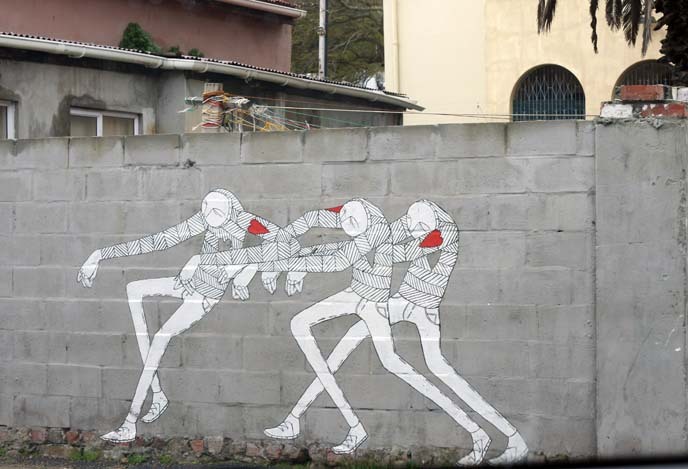 The artists get permission to paint the walls, and work with residents to create a design. Many incorporate portraits of the homeowners, or elements that reflect their personalities. I suppose I’d live in this Victorian home with cute pastel elephants on the front. 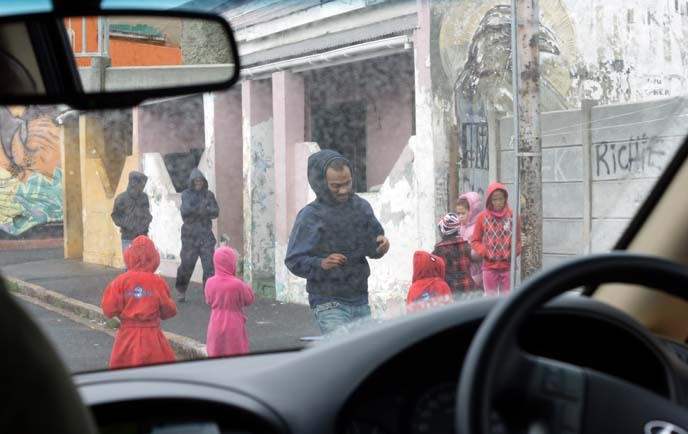 Apartheid only ended in 1994, and locals still remember how it loomed over their lives. In the spirit of Nelson Mandela, many chose to paint messages of tolerance. 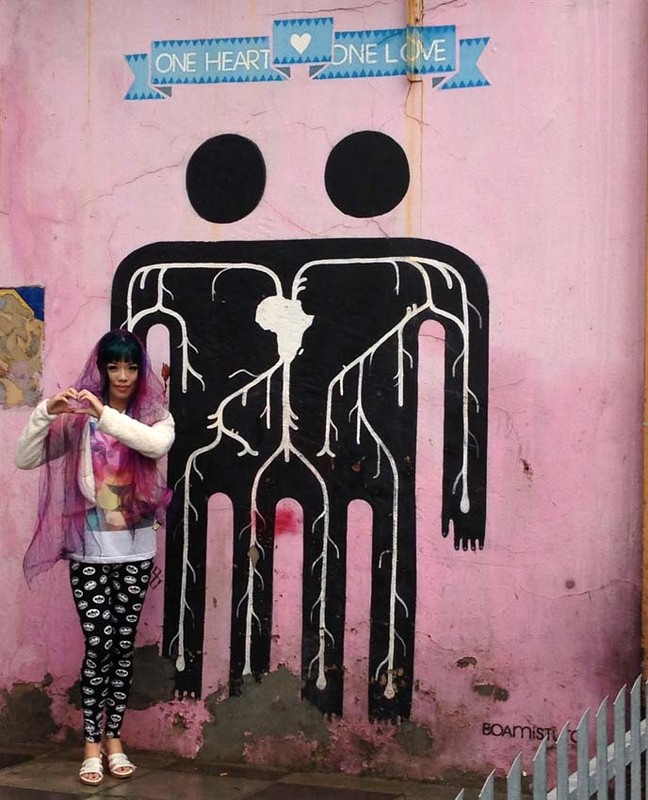 One of my favorites is this “One Heart, One Love” mural by Boamistura, a group of five Madrid artists. 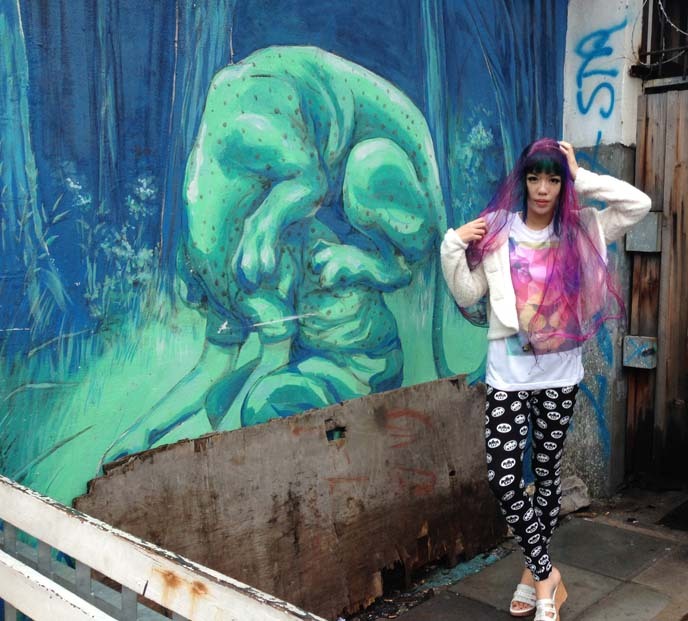 I’m dressed rather internationally: a rainbow lion t-shirt from Chatuchak Market in Bangkok, leggings from Hong Kong’s Izzue, a fuzzy jacket from Peace Now Japan, and a scarf from San Francisco’s Chinatown. The “most fabulous” award goes to New York’s Cern, who made this purple marvel starring the homeowner’s deceased white cat. 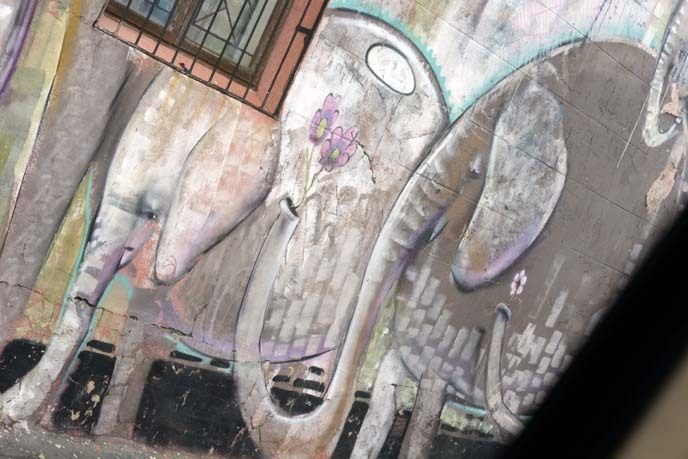 I like how he used the curve of the gate to make an elephant’s forehead and trunk. Juma walked with us all around Woodstock, pointing out hidden works and talking about their inspiration. 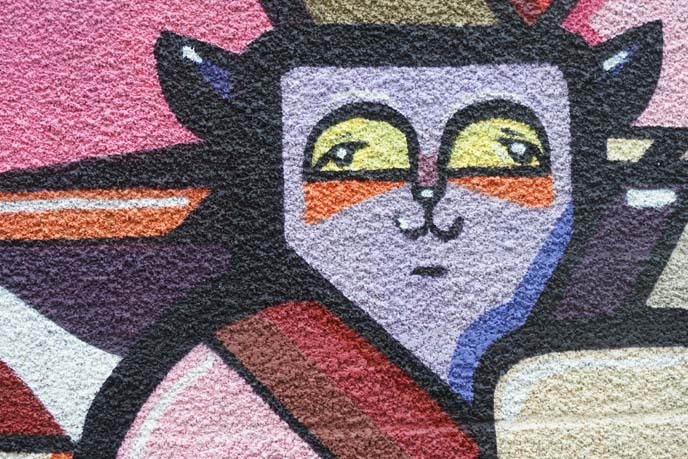 Colors and cute faces peeked out from alleyways. Andy Warhol would give a thumb’s up to this wall of product labels. 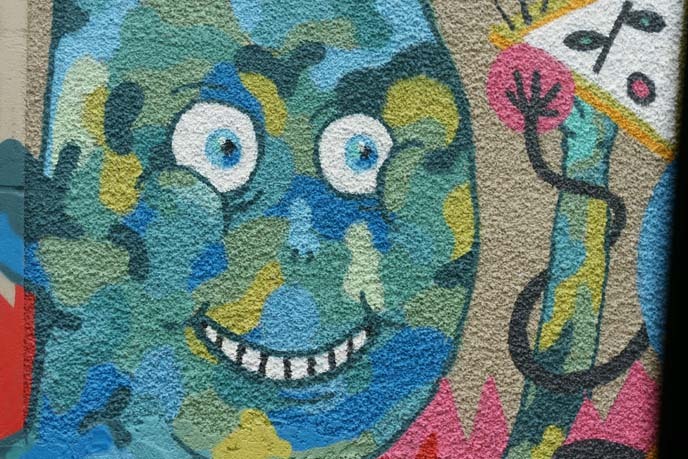 The Woodstock art initiative has truly uplifted the district. Children help out with the painting, and locals say they’re proud of their decorated homes. 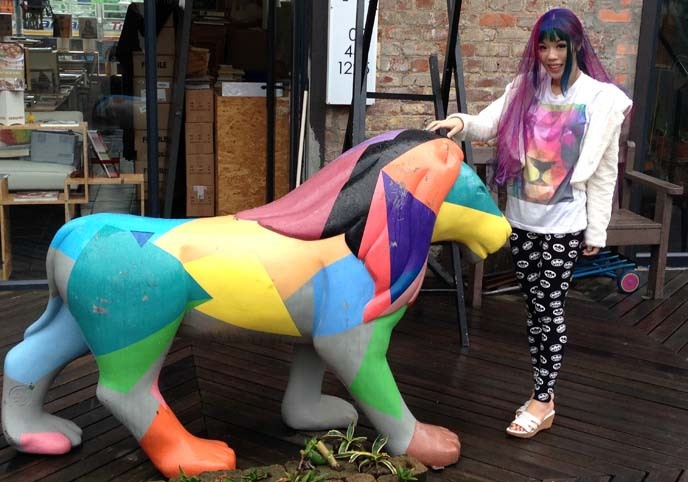 What a coincidence: this segmented rainbow lion statue perfectly matches my Thailand t-shirt! 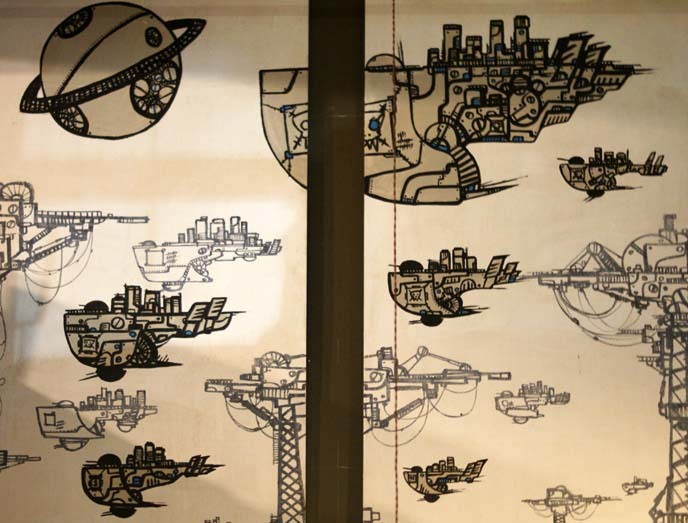 Just by walking around and interacting with the designs, I felt uplifted. I’m a big supporter of using art as a means for positive change. I could sense that the murals were made with passion. Some had important messages of anti-poaching; this one reminds us that hundreds of rhinos are still killed each year for their horns. Some works were black and white, and abstract. This intricate design is by Yumanizumu of Japan. Others encourage you to pose and have fun. Help, I’m being attacked by giant bees! 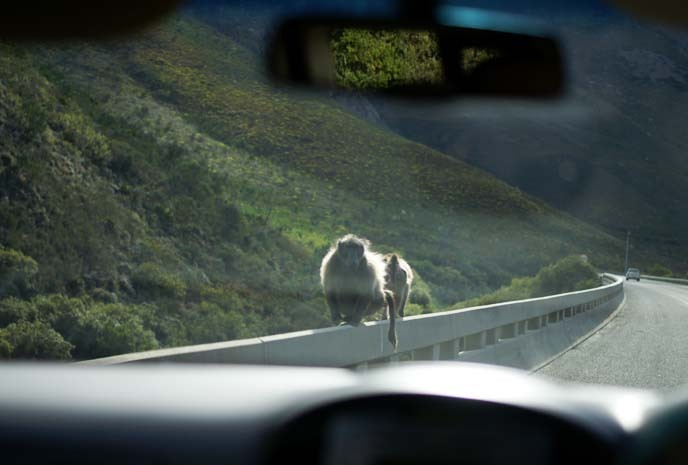 Quite a few hint at the tumultuous history of Cape Town. Woodstock is next to District 6, where 60,000 people of all ethnicities lived together until they were relocated by force in the 1970s. Today, District Six is razed and empty. I thought the most successful works were the ones that were vivid, had a connection to Africa, and made you think. 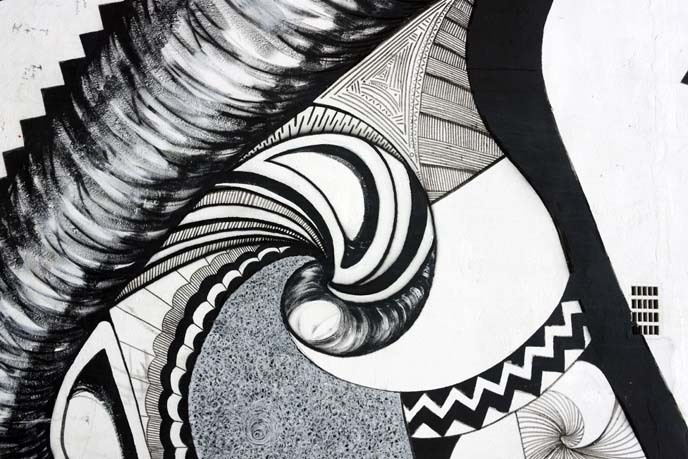 Interesni Kazki’s “Zebra Suit” is a great example, and leaves the meaning open to your interpretation. When Juma told us to look up, we all grinned and did the “Carleton dance.” It’s Will Smith, as the Fresh Prince of Bel Air! 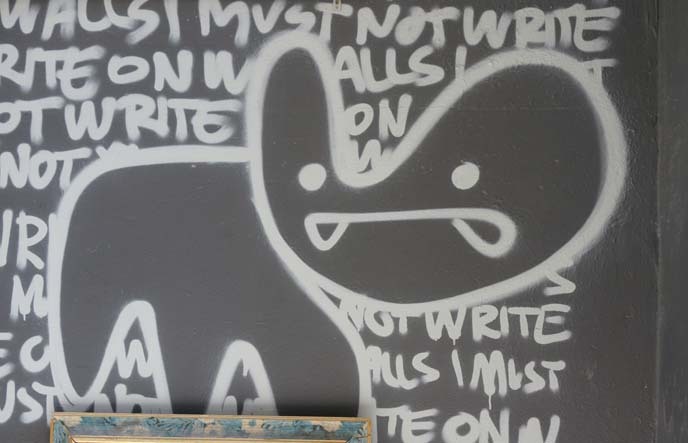 Time to explore Woodstock Exchange or WEX, a modern building that incubates young artists and creative shops. The open space is very Portlandia-hipster, isn’t it? Woodstock Exchange features public installations, like this swing. I’ll later take you inside the creative studios, where artists work and play. I’m a fan of this sleeping dog statue by Frank van Reenen. 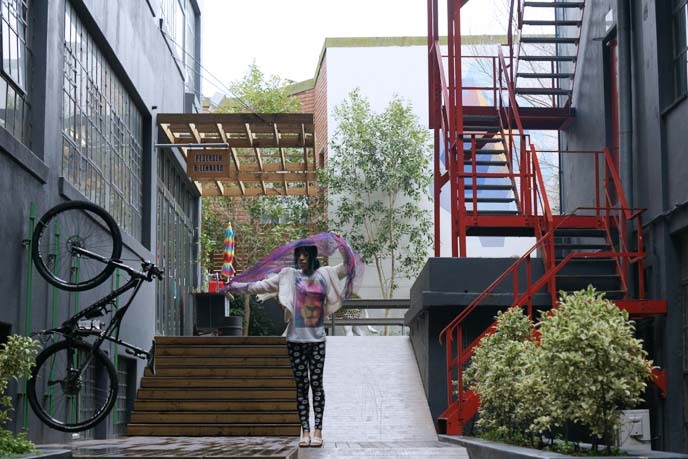 Next door, there are multiple design and fashion boutiques, and art galleries. We had a healthy lunch at Superette. 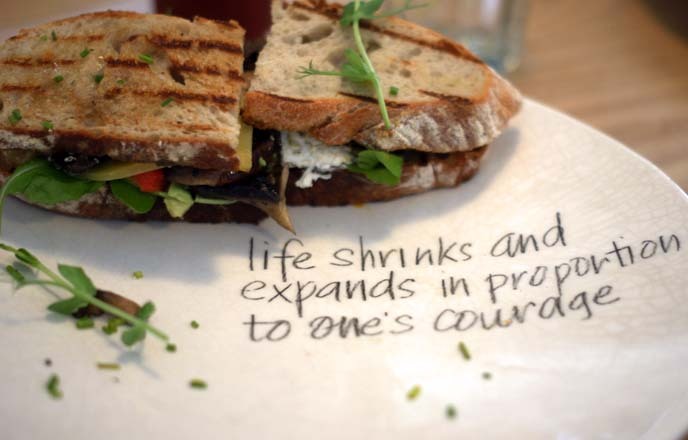 I could eat their veggie sandwiches and protein-salad plates every day; everything is prepared with locally-source seasonal ingredients. For a drink, it’s hard to decide between the fresh lemonade, ginger kombucha, local roast coffee, and craft beers. 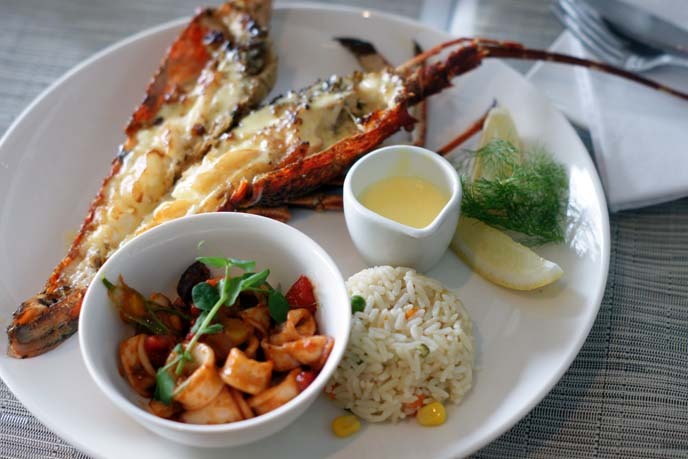 On a different day, we ate fresh seafood at Ocean Jewels in WEX. $4 US for a plate of grilled angelfish and sweet potatoes. Once again, I could have this daily! Leave room for a drink at Lady Bonin’s Tea Parlour, described as a “Purveyor of Magical Infusions and Tasty Curiosi-Teas.” I tried brewed buchu, a South African woody plant that has traditional medicinal properties, and is drunk to help digestion. 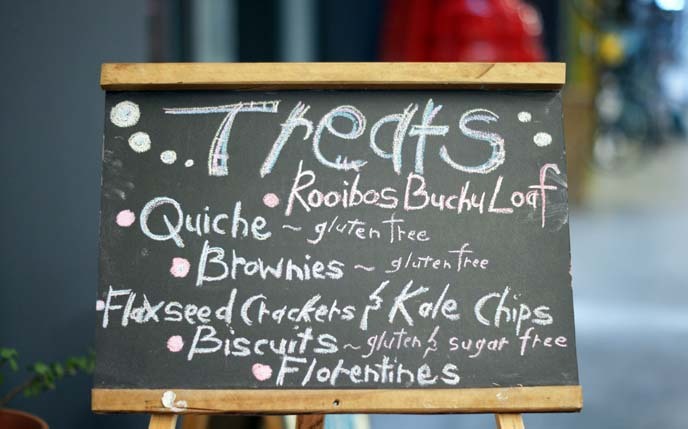 Lady Bonin also serves gluten-free and sugar-free snacks. 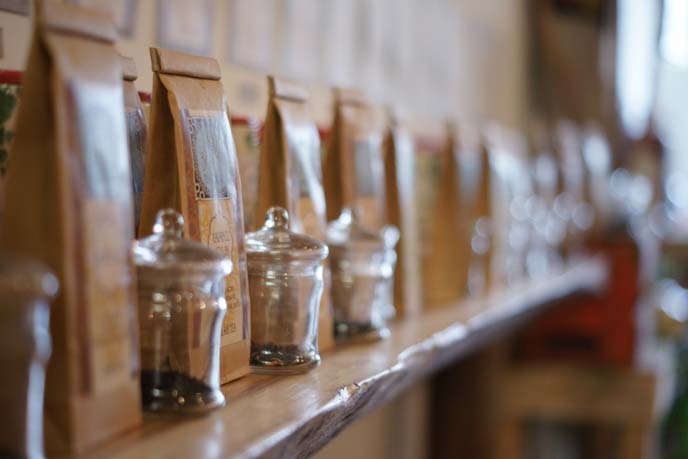 We tried the matcha, and rooibos with mocha. 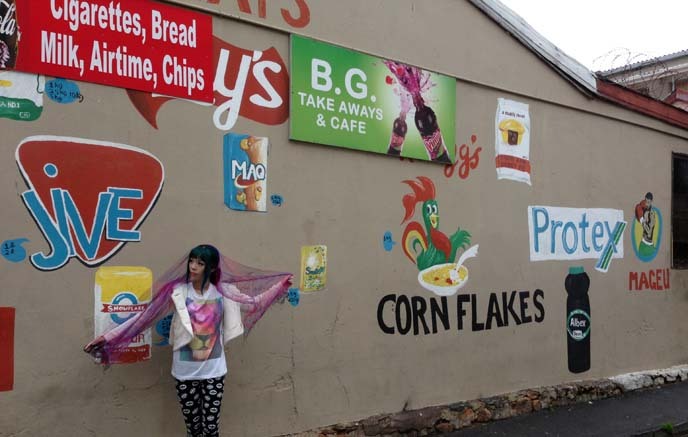 Isn’t the street art in Woodstock incredible? Gotta love this blue fellow with Bam Bam hair. Thanks Cape Town Tourism and Juma for the inspiring tour. … and Remed. Without doubt, South Africa is a Rainbow Nation. PS: Don’t forget, I will be in the Philippines (Cebu), China (Shanghai) and Hong Kong soon! 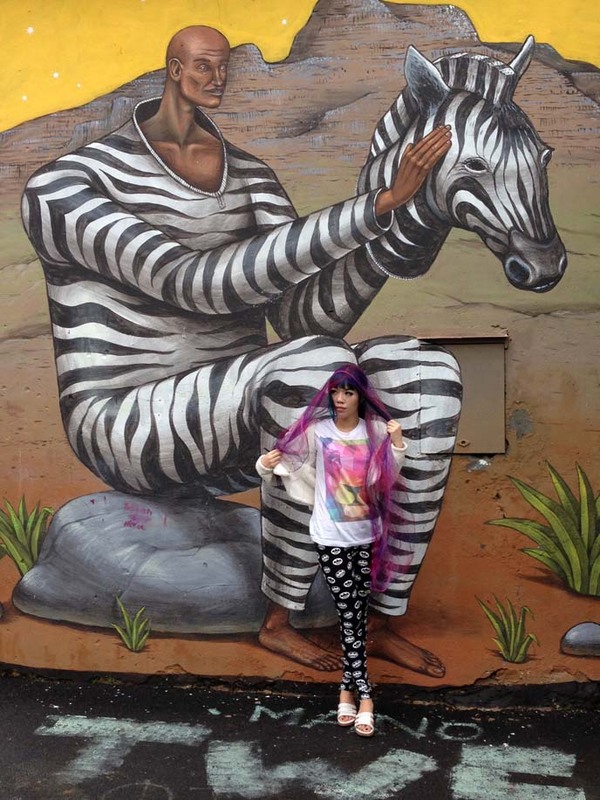 Let me know your travel suggestions, and follow along my trips in real-time on my social networks (@lacarmina, linked in the right sidebar).